Rafal Majka won today’s stage from an audacious attack out of the break on the Col du Tourmalet, soloing to the finish where he dedicated his victory to his teammates and vowed the team would continue the fight until Paris. There was no movement at the top of the table as the leading contenders marked one another closely in the suffocating heat until the final ascent to Cauterets where defending champion Vincenzo Nibali was dropped and slid out of the overall top ten, his place taken by Bauke Mollema who had attacked on the last climb, as did Alejandro Valverde who gained two seconds. Last year on his Tour debut Rafa Majka won two stages and took home the King of the Mountains jersey. Today he opened his 2015 account. The 25-year-old Polish rider attacked from an eight-man break on the Col du Tourmalet around 45km from the finish. He crested the col taking the Souvenir Jacques Goddet and increased his advantage on the 31km descent before bringing it home on the final third category climb to Cauterets. He crossed the line pointing to his jersey with a broad smile on his face. Last year Majka rescued Tinkoff-Saxo’s Tour after Alberto Contador abandoned with a broken leg on stage ten and, once again, he’s given the team something to celebrate after Contador lost several minutes in the first mountain stage yesterday. The Tour de France is not finished but I have not come here for the GC. 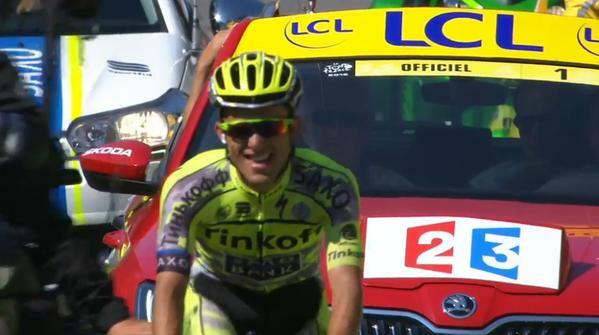 I came here to help Alberto [Contador] and still we have some opportunities. It is still a really long Tour de France, a long two weeks left, and we need to fight for Alberto Contador to win the Tour de France, 100 per cent. I feel an honourable mention should go to fellow Brummie Dan Martin, awarded Most Combative for his bridge across to the break and his relentless pursuit of the stage winner to record his second runner-up slot – he was also second on stage eight. 1. Sticking to the script. Sandwiched between yesterday’s brutal stage and tomorrow’s to the HC Plateau de Beille, this rambling route taking in the Tour’s two most famous mountains – Col d’Aspin and Col du Tourmalet – was likely to finish with a successful break. The pace was fast and furious for the first 80km as riders kept trying and failing to get into the successful break of the day which started as a quintet and grew to a group of eight as more riders bridged across. Happy with the break’s composition, the overall contenders were busy absorbing the implications of yesterday and plotting their subsequent fightback. 2. Sagan back in green. Peter Sagan regained the jersey he’s made his own for the past three editions of the Tour thanks to a second-place in the intermediate sprint, ahead of today’s holder Andre Greipel (Lotto-Soudal) whom he now leads by a margin of seven points. 3. French hopes live on. 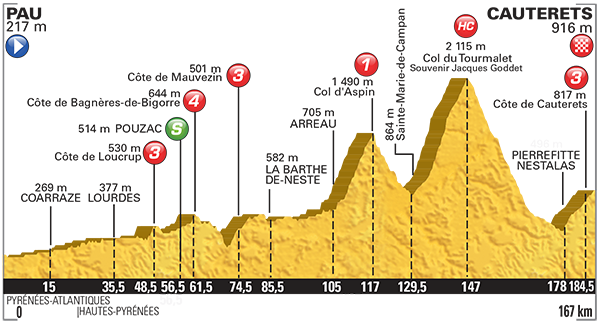 Tony Gallopin, who won a stage and wore the yellow jersey for a day last year, and Warren Barguil are giving the French something to cheer about on the GC. Gallopin looked particularly solid while Barguil, who fell in yesterday’s feedzone, clawed his way back onto the leading group on the descent of the Tourmalet dodging cows and one of Lotto NL-Jumbo’s cars. Though one can’t help feeling he’s probably used up a couple of his nine lives! 4. MTN-Qhubeka. The team proved once more that they are worthy wildcard participants. Today a number of their riders tried to infiltrate the break and Serge Pauwels succeeded. He gave chase to the speeding Majka and at one point looked as if he would finish runner-up on the stage before being overtaken on the climb to Cauterets by two of his breakmates – Martin and German national champion Emanuel Buchmann. King of the Mountains leader: Chris Froome (Sky).